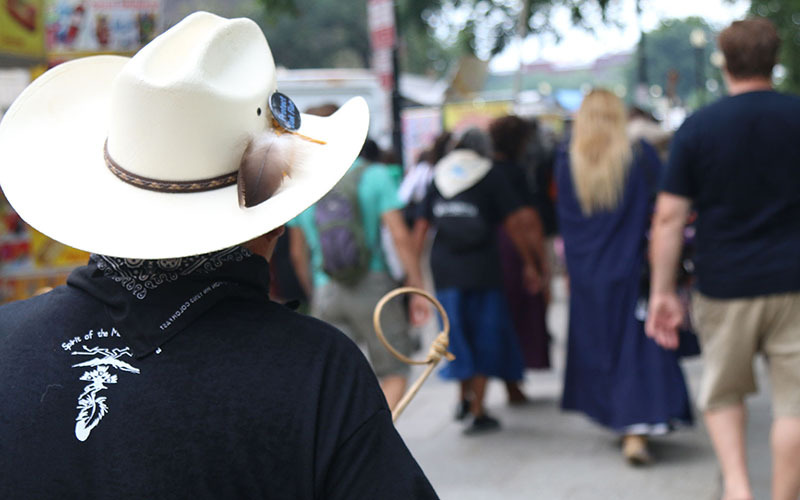 WASHINGTON – After weeks of taking their message to churches and tribes around the country, a caravan of San Carlos Apache members sang and prayed in Washington Tuesday for the preservation of sacred sites in southeast Arizona. 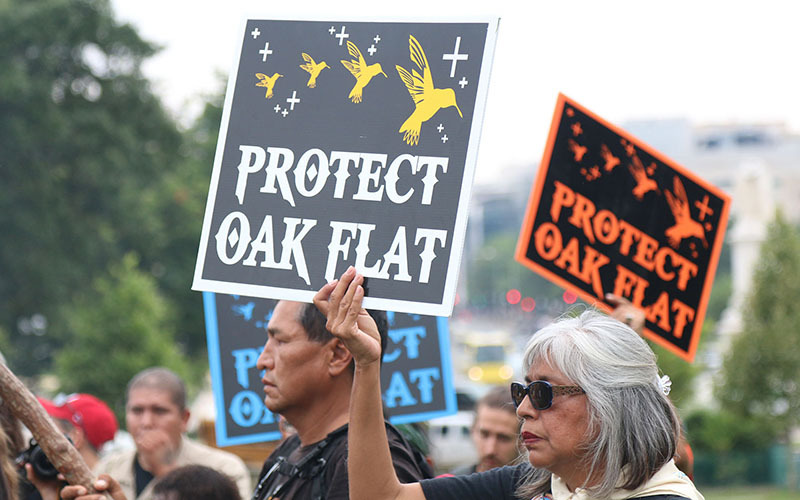 The group of about 50 men, women and children was in Washington for the first of two days of lobbying to protect Oak Flat, part of a land swap between the federal government and Resolution Copper for a massive copper mine near Superior. 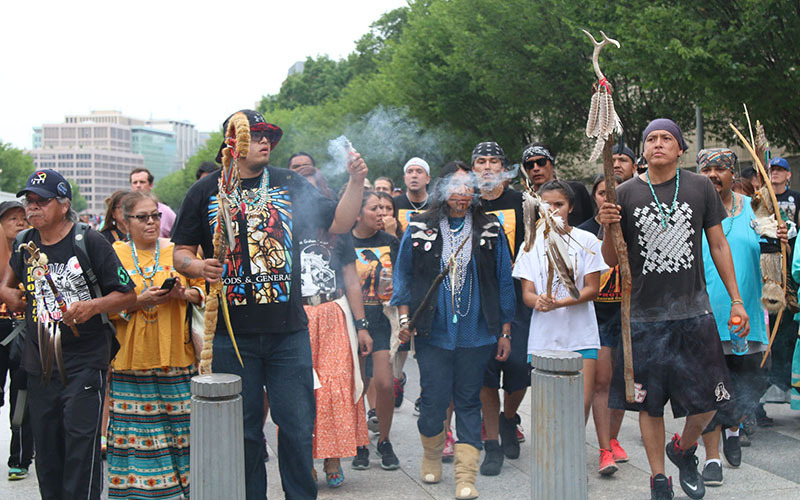 But to members of the San Carlos tribe, the land at Oak Flat is filled with life, a place where they go “to be Apache” and practice their beliefs, said Naelyn Pike, 16, one of the protesters in Washington. The group gathered outside the White House to pray before heading down Pennsylvania Avenue to the Capitol, where they gathered for dancing, drumming and singing. “It seems that we’re bringing the light here,” said Wendsler Nosie, a member of the tribal council, on the Capitol grounds. Supporters of the copper mine proposal insist that it will not harm cultural or environmentally significant sites, but will enhance them. At the same time, the project has the potential to bring thousands of jobs to the region and as much as $1 billion in annual economic activity for the estimated 60-year life of the mine. The Resolution Copper deal has been pushed in Congress for several years. It called for the government to give 2,422 acres of national forest system land that happens to sit on top of “one of the world’s largest undeveloped copper resources in the world,” according to information from the office of Rep. Paul Gosar, R-Prescott, and a backer of the deal. In exchange, the mining company would give the government “5,344 acres of high-priority conservation lands” in the state, Gosar’s office said. Bills to allow the swap failed in several different sessions of Congress. It was not until December, when Sen. John McCain, R-Arizona, attached the language to a defense bill, that it passed the House and Senate. Critics are angry not only with the terms of the deal, but with the way it was enacted. But in a statement Tuesday, an official from Americas-Rio Tinto, the company that would operate the mine, pledged to work with opponents on their concerns. “We recognize that Native Americans are citizens of sovereign Native governments, and have historical and cultural connections to land and water, and we are committed to involving and seeking input from local tribes,” said Jennifer Russo, communications general manager, in a prepared statement released by the company. “We will continue to reach out to the tribal leaders who oppose the project in the hopes that we can open the lines of communication and work cooperatively to address the issues,” the statement said. But the sweaty protesters who marched down Pennsylvania Avenue on a stifling Washington July day were having none of it. Pike said the project threatens the tribe’s holy lands, its rights and beliefs. The tribe wants “to create a path … we’re able to pray and go to these holy places free of fear” that those lands will be taken away, she said. 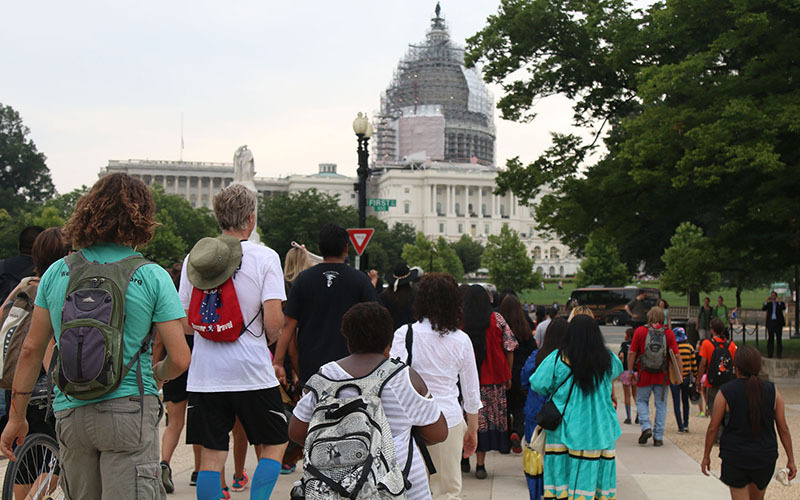 “This day gives hope to not just Native American people, but American people in general,” Pike said, at the group marched toward the Capitol to the beat of their drums. Even after they were told they could not congregate in Lafayette Park across from the White House, and getting honked at by some angry motorists during their sweaty march to the Capitol, marchers still seemed to keep their spirits up. “Today is a really blessing day, because it all comes with spirituality, it all comes with prayers,” Pike said. 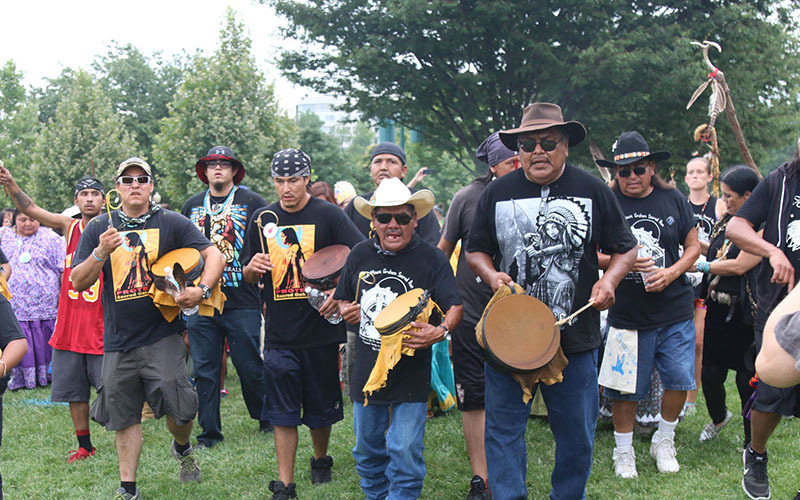 It was the first of two days of protest in Washington, with tribal members scheduled to be joined Wednesday by lawmakers, including Rep. Raul Grijalva, D-Tucson, who has sponsored a bill to reverse the mine land swap.